The first episode of the new IF series blends drama, science and audience interactivity. But it was not so long ago that the production team was still searching for inspiration. Writer Jason Sutton takes an irreverent look back at the early stages of planning. This episode commission was originally about the UK housing market. Easy peasy, I thought. I know all about houses; I live in one after all. And then it changed (some internecine struggle on the first floor of White City). They called me in for a meeting. Oh, the IF production people love a meeting. Why make a phone call when you can have a meeting, a nice long one too? "Jason, we'd like to do a piece on stem cell technology, set in the future. A court case in fact, a landmark British trial." "Smashing", I said. "Obvious, really." "So have you written sci-fi before?" "No." "Have you been involved in any legal drama?" "Not as such." "Oh." Long pause. "But I have written extensively on protein marker systems, somatic cell nuclear transfer and problematic telomeres on transcribed DNA." Buoyed by the success of the meeting, I applied myself to the details of the fictional Old Bailey trial. It soon became obvious that the drama in this episode would necessitate masses of research. There was nothing that I could pull from my own life. And the problem setting the drama a decade away was that the extrapolated scenarios would have to be completely plausible. This meant talking to experts in UK law, EU and international law, spinal surgery, UK constitutional affairs, stem cell technology, ethicists and all manner of pressure groups. It was at another meeting that we addressed a central problem: for a court case we needed a crime. 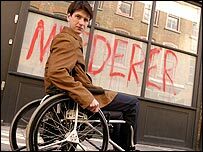 Dr Alex Douglas (the heroine/villain), in her efforts to create a new cure for spinal injuries (one of the great hopes for stem cell technology) had to have broken a law. To provide dramatic interest she also had to have made some medical breakthrough that demanded illegal action. Several meetings later and it was obvious what we needed: Dr Douglas had found a new way to clone human beings; one that was both viable and scientifically robust. "Yeah, and can we have that by tomorrow morning?" I also wanted to expose the state of the UK law in this area. Currently, you can terminate a foetus up to and including the point where it represents a viable human being but you can only experiment on a foetus for the first 14 days, until a line of cells called the "primitive streak" appears. Luckily, my fee for the episode was so fulsome that I did not mind taking on vast amounts of extra research. I made a phone call to Dr Stephen Minger, a leader in the field of stem cell technology. After much conversation we came up with an idea. 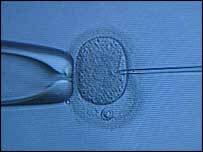 Alex would take the human embryos "in-vitro" to 19 days (five days post "primitive streak", so technically illegal). This is when the ectoderm (a differentiated layer of the embryo) has thickened to form the neural groove. This groove is the precursor of the embryo's nervous system and it is one of the first organs to develop. It is this cell mass that Alex extracts. Dr Minger generously agreed to split the Nobel with me. If... Cloning Could Cure Us was broadcast on Thursday, 16 December, 2004, at 2100 GMT on BBC Two.